Yesterday I finally finished my Back-to-school u neck vest from the Fitted Knits book. I wanted to look back to see how long it actually did take me and found my blog post dated Nov. 13 2007. So...it didn't quite take a year. ;-) This has been quite a year for me - there hasn't been a lot of knitting or crafting time until recently and it was with a real sense of gratitude that I finished off this vest. I am so pleased to have time and energy to devote to handcrafting again. Somehow it seems that all of a sudden it is November and I am realizing that I would like to get going on making gifts for our family for the upcoming holiday season. I don't want to leave everything until the last minute...I want to enjoy the process. 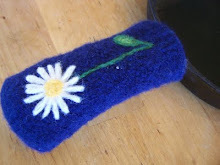 I'll have to put my thinking cap on to come up with some new gift ideas, my family is all stocked up on felted slippers (my favourite thing to make the last two years). I know what I am making for E thanks to Knitting Iris' post about knitted chainmail. Many people will be getting shopping bags - produce bags and big shopping totes - made out of re-purposed fabric. Hmmm, I guess it is time to get going on some projects and see what other ideas we can come across. 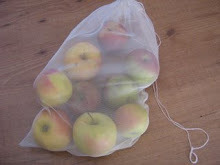 I just want to leave a quick note to say I was so proud of myself for brainstorming an idea for produce bags yesterday, we have eliminated the big ones but I hadn't thought, until now, about the little ones - seems silly now... Anyway, I'm again amazed at the synchronization of our thinking when today I come here and see the link to the great produce bags that you made months ago! And the Pioneer Story is one of my all time favorite books in so many ways... Kale went through it a lot at farmschool over the last year. Nice to see you enjoying it! PS, are you enjoying Peaceful Living? It's a daily ritual for me and I'm so thankful for it! OH WOW! that looks SO good on you! so glad your arm is better so you could finish it. yay! what a year, indeed! 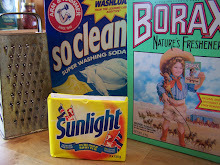 I'm addicted to those produce bags made out of old sheer curtains. I can't stop making them. They are also fantastic for using at the bulk store -for bulkier bulks like beans, rice, wheat, etc. I love that they fold up so small and can be tucked in purse pockets to always have on hand. 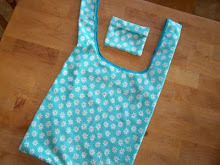 Would love to hear what you came up with for making produce bags as well, it's always fun to see some new ideas. I loved reading Peaceful Living. I got it from the library so had to read it all in one go instead of as a daily meditation but I found it to be a really inspiring book. I really like the way it was done and the author's way of explaining things. New to your blog and really enjoying it. This sweater is just lovely. The fitted design feels very fresh. My knitting skills are beginner at best, but I hope to work my way up from scarves and hats to sweaters.